Strictly speaking, any cocktail is an 'afresco' cocktail, provided you drink it outdoors and indeed, go to most of my previous posts and you'll find something to fit an outdoor occasion, but the combination of good weather and a long weekend, gave Mr TG and I, more time than usual, spent in the garden, cocktail in hand. There's nothing quite like sipping on a chilled glass of something or other, barefoot, toes in the grass and listening to the sounds of the garden. Of course, back in the real world, the idyll was short lived as we were invaded by our Nerf gun toting offspring declaring war, but the cocktails helped soften the blow. All of this week's selection would make an excellent accompaniment to an afternoon spent in the sun, although I do recommend slapping on the sunscreen beforehand and quaffing lots of water too, as cocktails have a habit of making you forget to take the basic precautions and before you know it, you'll have a blinding headache and rosy glow that could guide ships in at night. Our long weekend began on Friday, when we bunked off to the City of London for a spot of lunch and to visit the wonderful Amathus, City in Leadenhall Market. If you click on the link you'll be able to see the lovely staff, who were both in store when we visited and couldn't have been more helpful. We were treated to a tasting of gins, one of which is definitely on my list for when the Hendricks runs out and to delicious Coffee and Cherry Heerings. In the end, we left with a bottle of Kings Ginger, a bottle of Cherry Heering, a miniature of Chase Marmalade Vodka and a bottle of rum which I will save for another post. Suffice to say that my knowledge of rum is greatly enriched and that I am inspired to devote a post to it entirely when I've learnt a little more. King's Ginger is a delicious and warming liqueur, prepared from the maceration of ginger root and added lemon oil. It is both spicy and zesty, not to mention more alcoholic than many liqueurs, weighing in at a hefty 40%. The story goes that it was developed for His Majesty, King Edward the VII, to stimulate and revive him whilst out driving his new horseless carriage. Cherry Heering, produced in Denmark, is an intensely fruity, cherry flavoured liqueur with a brandy base. 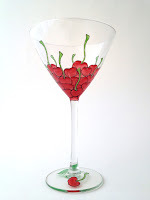 It is world renowned, highly valued in cocktails and generally considered the best of the dark cherry liqueurs. As you can probably see from the picture, it is so delicious, we had opened the bottle and had a snifter before I remembered to take a picture of it. I was extremely excited to try this out, having fallen in love with Chase Elderflower Liqueur, in the past. A perusal of previous posts will play this out as you'll notice that it crops up a lot. Let me just say, it did not disappoint. It has all the zesty, oranginess you would expect and a slight caramel, sweetness that gives it that unmistakable, marmalade flavour. All of these tipples are worthy of drinking straight, in a schnapps glass or in a tumbler, over ice, but equally, make some great cocktails, so if you decide to buy, you can be sure they won't be lurking malevolently at the back of the cocktail cabinet, gathering dust. Anyway, enough waffle....to the cocktails! 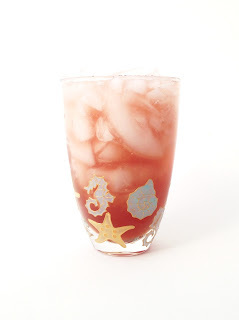 This is a variation on the Singapore Sling, a cocktail made famous by the Raffles Hotel in Singapore. There are so many different interpretations, all claiming to be the original, but this definitely isn't. The original did not use soda and featured lemon rather than lime, not to mention, the ratio of gin to Heering was more in favour of gin. The original was a very sweet cocktail, but this is not, particularly if you leave out the simple syrup. To be honest, on this occasion, I preferred it with, as it still wasn't too sweet when served over ice. Originally this recipe was made without the ginger beer, but it didn't quite have the warmth you would expect with the addition of Kings Ginger. As Mr TG noted, it was a bit like a very strong vodka and orange, which is odd because it's made with gin, but his senses may have been slightly impaired by then. Anyway, a quarter ounce of Fever Tree ginger beer was just what it needed and so it was renamed, the Knock Down Ginger. I picked this next recipe because of it's inclusion of Cherry Heering and because the name, Flying High, sounded fairly auspicious. The cherry flavour is quite intense in this one, so if you're not a fan of that, it's probably not for you. The egg white gives the drink a nice texture, but the colour does let it down a bit. After I had tested it, I put it in the fridge, to wait for Mr TG to come home and offer his insight and strangely enough, the drink cleared and looked far more appealing. Incidentally, Mr TG was rather partial to this one. This next recipe was devised, purely on a whim, without much forethought and it turned out to be rather exceptional. Of course, the fine ingredients are the stars here, but I'm rather proud of my effort all the same. 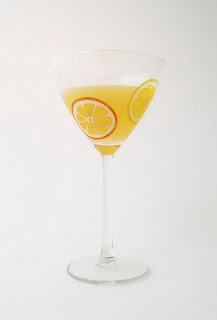 Although there is no added simple syrup in this cocktail, both King's Ginger and Chase Marmalade Vodka are sweet, so the addition of lemon juice stops it veering into sickly territory. I used a full two ounces of juice in this one because I wanted something refreshing, without resorting to serving it over ice. The addition of egg white adds a silkiness to the texture without altering the flavour and gives the cocktail a little more substance. 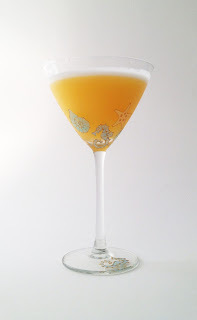 So, of all this week's cocktails, The King's Chase was a clear winner for me and I will definitely be making it again. I can highly recommend investing bottles of both Kings Ginger and Chase Marmalade Vodka. The Cherry Heering is delicious too, but I've yet to try a cocktail, made with it, that really blows me away. Perhaps I need to come up with my own....watch this space.